In a serving bowl, whisk together lemon zest, oil, lemon juice, 1/2 tsp. salt, and the sugar. Set aside. In a large saucepan fitted with a steamer basket, bring 1 in. water to a boil over medium-high heat. Steam edamame, covered, for 3 minutes. Add chickpeas and steam, covered, until heated through, 4 to 5 minutes. Pour both into a colander, then pat dry on a kitchen towel. Add to bowl with dressing and toss to coat. In the same saucepan, bring another 1 in. water to a boil. Meanwhile, fill a large bowl with ice water and set aside. Steam green beans, covered, until tender-crisp, 4 to 5 minutes. Pour into a colander and immediately transfer to ice water. Let sit 30 seconds, drain, and pat dry on towel. Add green beans and onions to chickpea mixture, toss to coat, and add more salt to taste if you like. 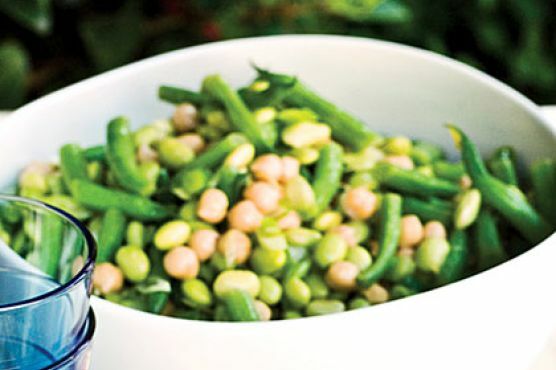 Make ahead: Prepare recipe through step 3, wrap chickpea mixture and green beans separately, and chill up to 1 day. Bring both to room temperature before proceeding. Dressed salad can stand up to 1 hour before serving.